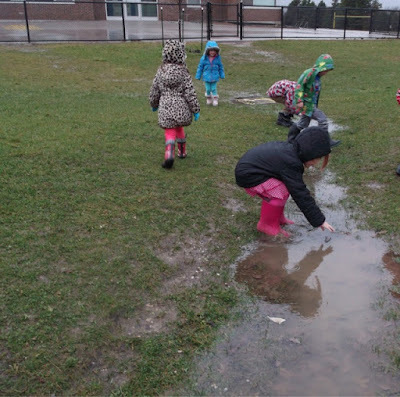 this kindergarten life: what learning doth a puddle offer? what learning doth a puddle offer? 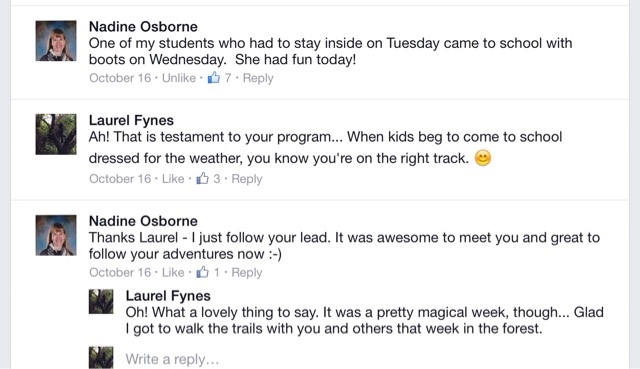 I met Nadine Osborne this summer at YRNC's week-long "The Rhythm of Learning in Nature" course. In my role as one of the facilitators for the week, I was able to learn and explore together with a wonderful group of educators and parents, and alongside my daughter who was attending the forest-school-inspired camp. The incredible professional learning session was a meeting of minds of Reggio-inspired educators with Forest-school inspired practices, grounded in the eolithism of Hawkins-inspired learning. It was a deeply engaging week that helped us all connect more deeply with place-based, emergent planning education. I was honoured to be a part of the team and feel a strong connection to those educators who walked along the paths and talked over worries, hopes and dreams together at Swan Lake. 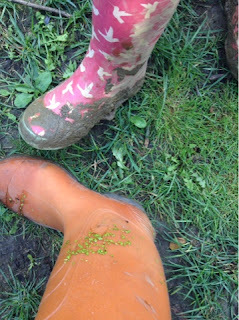 Like daughter, like mother - we met up along the path and had to laugh when we saw each others' boots - I had been wading into the duckweed, and she had been playing in "the mud kingdom". 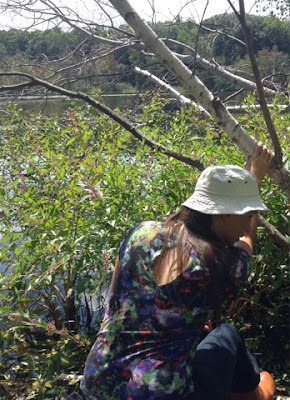 Holding on tight as I inch along a log over the shallow water at the edge of Swan Lake. Photo by Anamaria. 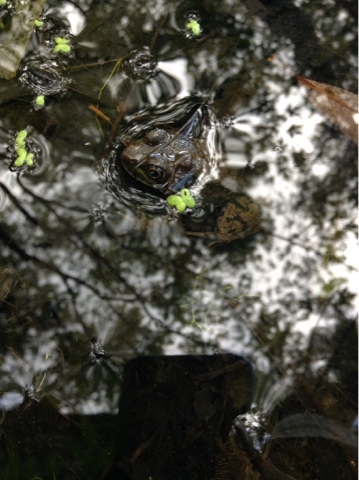 One of so very many frogs and other pond creatures seen during our week at Swan Lake. We don't live near enough to bump into each other during the school year, but I often see Nadine on social media along with many other in the #ReggioPLC who participated in our magical week at Swan Lake last summer. One wonderful conversation took place about 6 weeks ago, when Nadine posted an inspiring story about her day at school. In it she referred to students jumping into the puddles with such force, it caused the water to go "so high it hit our faces". I burst out laughing, remembering similarly "messy" moments from the YRNC summer course, where boots got stuck in muddy ponds, or stagnant puddle water splashed our clothes, or a particularly messy moment when, while following a damselfly, I slipped down a bare-dirt stretch of hill and wound up knee-deep in the mud. 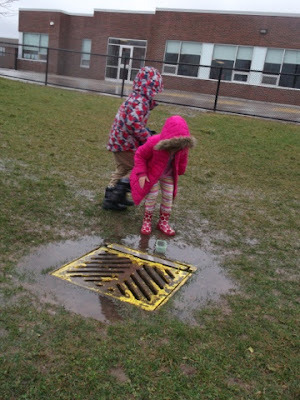 Reading her post, I was most touched by the following: "I learned that when I supervise my own students in risky play they show they can manage risk." Yes! That was so much the message of "Rhythm 2015" - that by embracing outdoor learning and trusting children to be curious and capable learners full of potential, we would discover a wealth of knowledge, passion and skill among our young learners, and ourselves. Together we could discover our limits, and push them outwards. I couldn't help but ask if she'd be willing to share her story here on my blog. Later, in a direct message conversation, we talked about what this post could mean, in terms of the larger documentation story I have been working on through guest posts and my own reflections. We spoke about documentation and how different we all are in our outlook and approach. We talked about the possibility for one child (or a few children) to stand in for the learning story involving many students. By taking a magnifier look at a student's growth (as she did beautifully in her story), one can illustrate both how the larger class learns from direct experience, and also illustrate an event that many found surprising and rewarding. We discussed how the documentation can be a metaphor for learning - that some students direct the inquiry, while others partake or even just observe, but all will have a memory of that moment, and most will have made meaning from it. At the time I said: "...there are kids for whom true exploration is just beginning... Handling loose parts and sharing space is about what they can manage. Later, they begin to ask questions, or attempt to answer those posed by provocations... Those are the meat of my shared documentation. My partner captures different things, and I like that. She captures snippets of events that I miss, lovely moments of art or sensory or language play that may not connect to big ideas we're playing with but which show a lot about the experience or the children. In fact, I think I should tell her this." (note: I did, in fact, tell Pooneh how much I appreciate her documentation, and what she captures from her perspective - often across the room from me). I read my quick words to her now, and realize I overstated the case somewhat - I try to listen to all voices in the classroom, no matter how they are "spoken" and no matter their interests and strengths. However I do appreciate the opportunity to think about the importance of one child's learning on any given day - that our job as teachers in a large early years classroom is to forge relationships with all students, and between all students, and to help all see themselves as learners. I think Nadine did this wonderfully, and I am grateful that she allowed me to share this here. Her words follow. Yesterday we had 2 indoor recesses, one was announced before it started and the second one it was decided to call them back in due to rain after the first ten minutes. The children were challenged to contain their physical energy within 4 walls and a ceiling. I had to divide and conquer together with my teaching partner. Today after getting all ready it was announced that it would be an indoor recess before they even got out the door. Faces were long. I was in the room to witness it even though it was really my lunch. I was hosting a school club meeting so I couldn't just throw on my stuff and go out with them. But I promised to take them out after recess was officially over. So since we had six students away today we only had a total of 21. Seventeen of them had rubber boots & raincoats, 3 did not and were happy to stay inside. The remaining child had "outdoor shoes" but dissolved in tears at the thought of staying in. He didn't fit the spare boots that were available so I made the decision that he needed to be outside more than the shoes needed to stay dry. I really need to build a relationship with this student. Last year he was in a different class with a different teaching team. I know from the way he looks at me and from his body language and tone of voice in communication that he doesn’t trust me yet. He doesn’t yet sense that I am on his side. I have been trying. Today that meant understanding how very deeply he needed to be outside. So I took 18 children outside in the rain and into the puddles and the mud. They burst from the door like popcorn from a hot air popper overflows into the bowl. 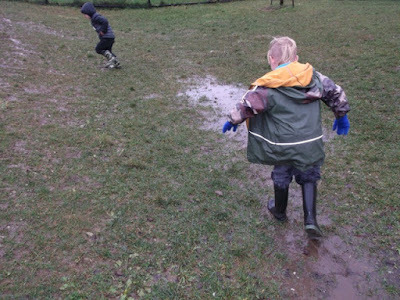 When they understood boots meant it was okay to stomp in the puddles they did a little more than stomp. After observing their obvious delight and assessing that they couldn't get much wetter anyway I suggested we have a contest. YES. I suggested we have a contest to see if we jumped in the puddle with all our might, who could make the water go the highest. That was me. Me, the teacher, with the provocation. Never would I have imagined it. After about 25 minutes of sheer joy the children were starting to get a little cold. I let the first group that wanted to go in with my teaching partner go ahead to start the process of changing into dry clothes. Another group remained outside with me to collect wet leaves. Then after five minutes we went in as well. We learned that most of the children could make the muddy water go as high as their bodies. Indeed they could splash their whole face with muddy water if they jumped hard enough in the puddle. We learned that we won't melt in the rain. We learned that school is not just a place with rules where we line up all day long and get prompted to sit criss-cross applesauce. We learned that we are strong, powerful and mighty. We learned that we can change our clothes, and dirty clothes can be washed. We learned that the world is a joyous place when we can explore it in ways that feel right. I learned that dirty clothes are better than notes home about behaviour. I learned that when I supervise my own students in risky play they show they can manage risk. I did not have any students who needed ice. If I made a rule they followed it because I didn't make any that weren't essential. I learned that today one child "had the most fun I ever had in my whole life". He was the child who didn't have boots. He was the child who needed the messy outdoors more than all the rest. I am not sure if I can express the learning in terms of the curriculum. It might be possible. But I am sure that RELATIONSHIPS underpin all the success I will have with these children. Today was a day of building relationships. If it happens that they grow up and forget the day we jumped in the puddles until our faces were caked in mud and our hearts were ready to burst with joy, I know I never will. When I think back to all the planning and gathering of materials for my sink or float lessons from previous years, I realize how far I have come. The road ahead might still be long, but I am well on my way. I trust the children and I recognize the value of a puddle. I love her reflection at the end - indeed, once you have harnessed the power of learning in the moment, it can be strange to look back at how we once were taught to plan for learning without taking the students' actual knowledge into consideration (for those of us who began in theme-based programs). When I think of the moments that change us most as adults - I mean change our outlook about what is possible and appropriate learning for children, I think of this powerful statement by David Hawkins. "We who have been involved in the study of science and children have ourselves been changed in the process. In some ways not easy to express, we have been liberated. Those of us who knew children before science (are) now seeing the former, children, and ourselves as well in a new light: as inventors, as analysts, as synthesizers, as home lovers, as lover of the world of nature. Those of us who knew science first, and children after, have an altered and more child-like view of science, more humane, more playful, and even at its most elementary, full of the most unexpected delights". A puddle reflected the world of possibility for Nadine, for her students, and for those of us who delighted in first reading her story. It was her story that brought me back to my (neglected for many months now) blog, only to discover the draft of a story about water as a metaphor for learning, and for reflecting on our learning. I thank you, Nadine, for sharing the joy.